It's thrilling to design the shape of a community. At Yale University I studied interactive design and programming under Dan Michaelson, who designed the site for the Whitney Museum of Art in New York. Michaelson's no-frills aesthetic was eye-opening for me, and has had a great influence on all my subsequent designs. 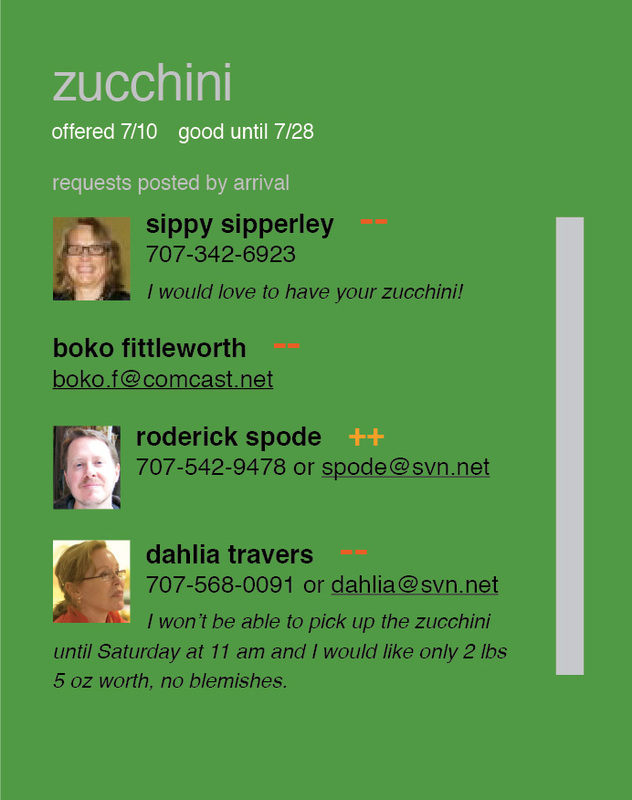 In ARTS167, we designed the front-end of our sites, programmed using Ruby on Rails, and managed databases. In addition to the technical aspects of the course, we read about how communities are formed. How do you build healthy online interaction? By using feedback and a point system that measured generosity I aimed to tackle several issues. Creating an online community where positive, altruistic interactions were rewarded and trolling behavior was minimized. Allowing small producers to share resources that would otherwise go to waste. Distributing resources locally to reduce carbon emissions. Encouraging gardening, exercise and the productive use of space. 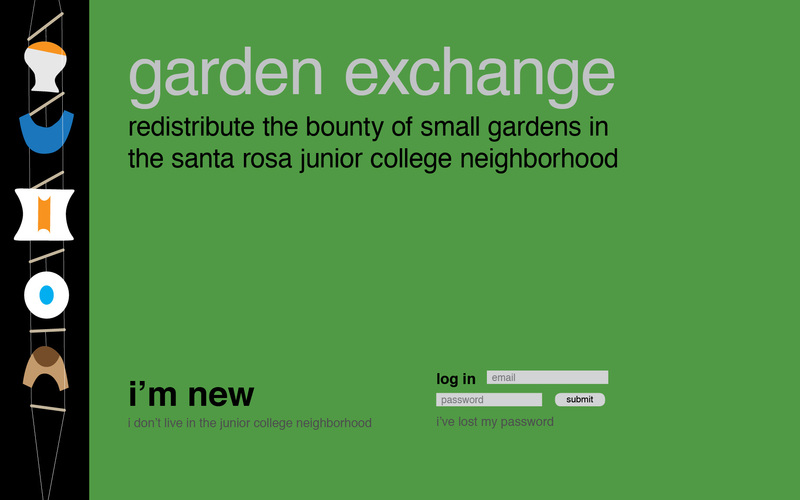 My project was a garden exchange for people in my neighborhood. A good garden always produces food to share, but distribution can be challenging. 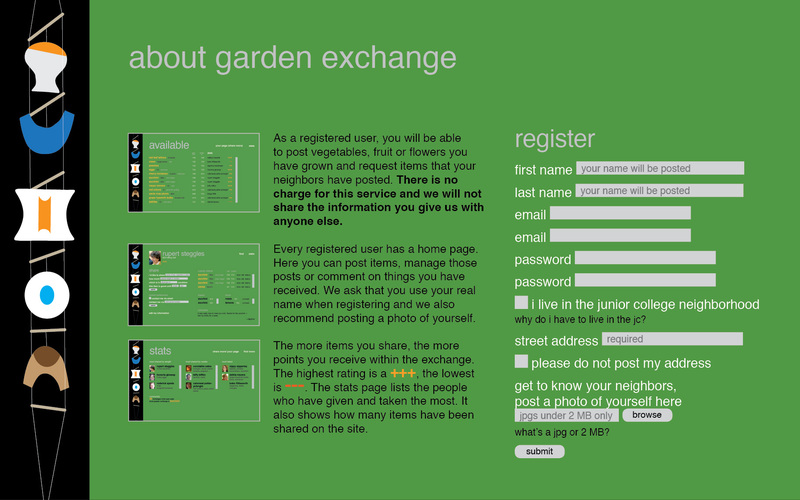 Using garden exchange, registered users would post and request items within a short distance. The exchange would also keep track of who was generous and who was not using plus and minus signs. Users would be required to post their photos and names. I wanted to encourage community building and generosity, and share resources within a small area. The project would distribute resources that commonly go to waste and cut down on transportation of food which adds to climate change. "As a registered user, you will be able to post vegetables, fruit or flowers you have grown and request items that your neighbors have posted. There is no charge for this service and we will not share the information you give us with anyone else. 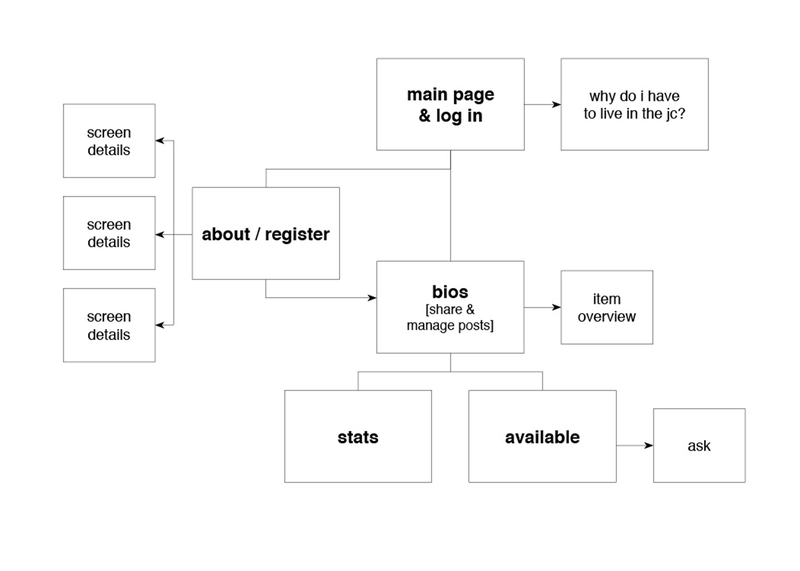 Every registered user has a home page. Here you can post items, manage those posts or comment on things you have received. We ask that you use your real name when registering and we also recommend posting a photo of yourself. The more items you share, the more points you receive within the exchange. The highest rating is a +++, the lowest is ---. 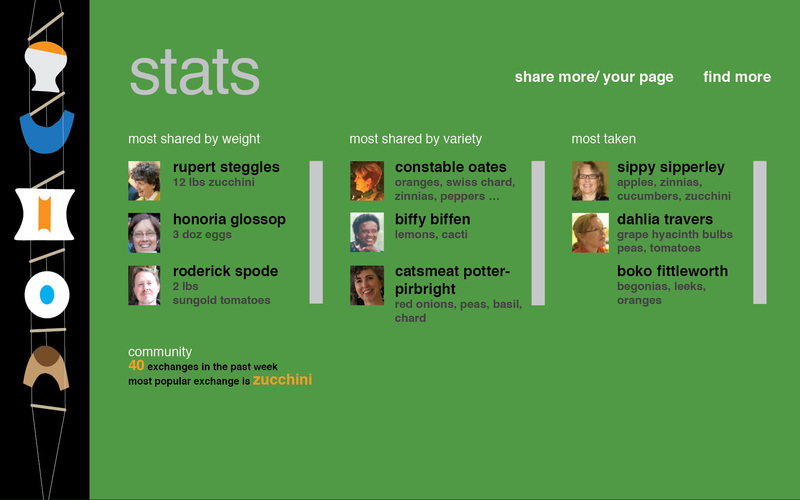 The stats page lists the people who have given and taken the most. 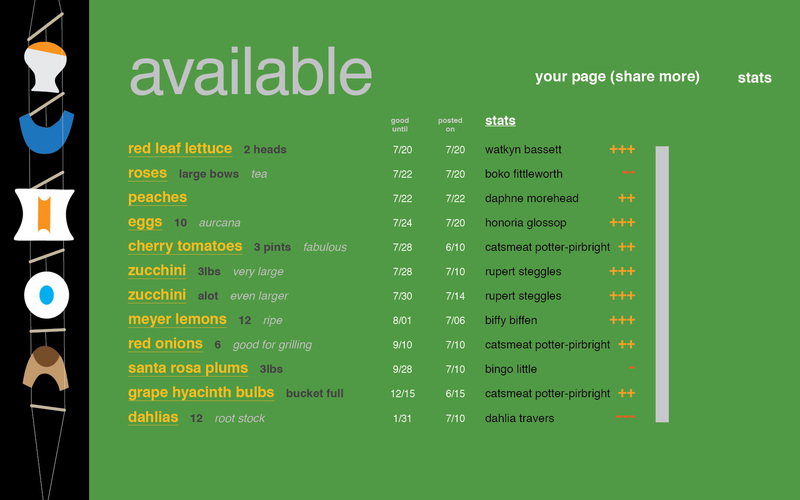 It also shows how many items have been shared on the site." 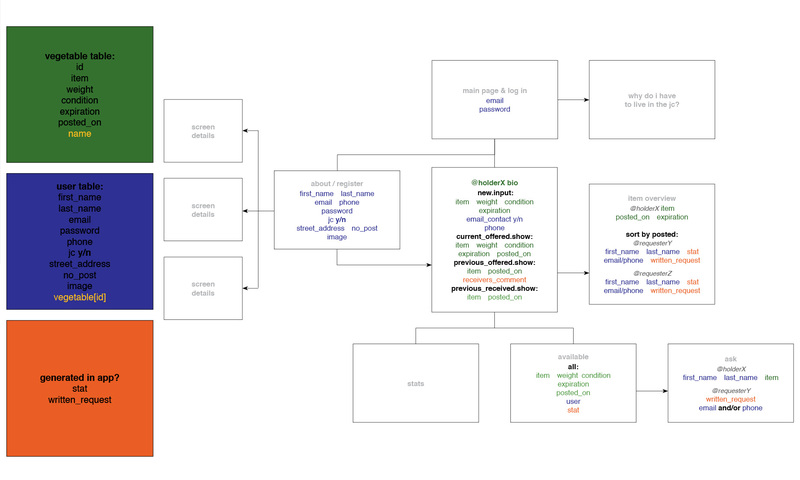 Showing relationships of databases to programming with color coding. 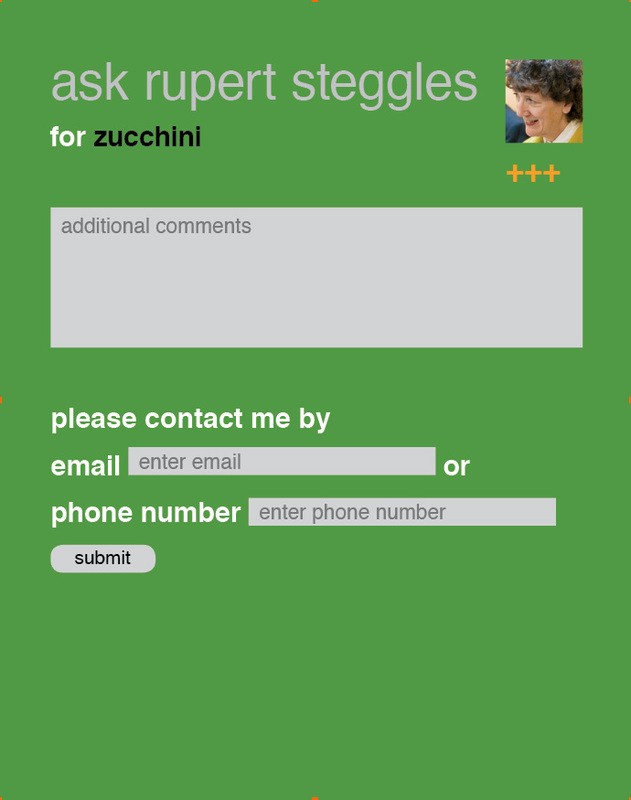 Users would be able to request items posted. The people with items to share would be able to review the requests and see who had been more or less generous on the site. People with plus signs had given more than they had taken. A stats page showed who was most and least generous. 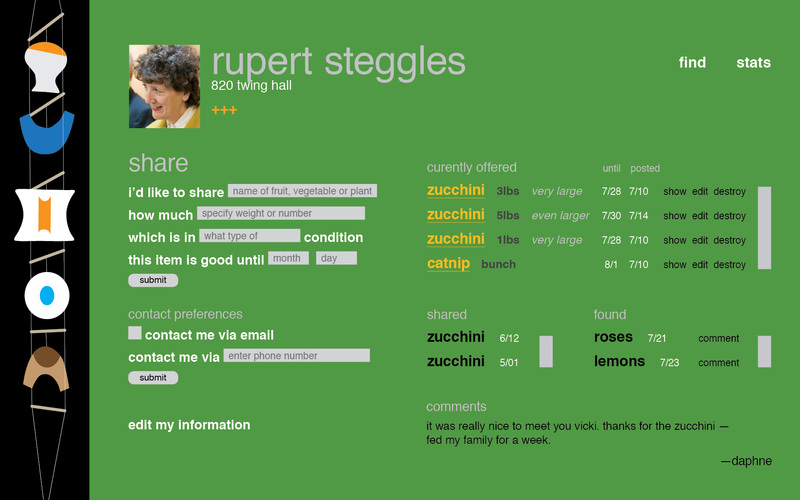 Each user also had a home page which aggregated all of their interactions. I got an A in the class.